In a nutshell: The Humax HB-1000S is a low-cost intro into the world of Freesat. 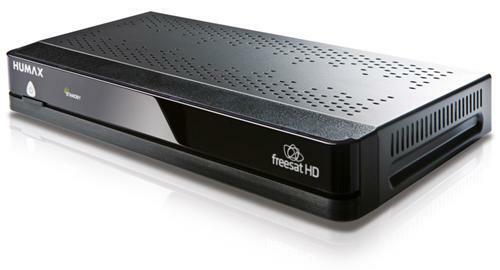 With no recording facilities, its the cheapest way to get Freesat channels, yet it comes with the benefits of catch up TV and home networking. The HB-1000S isn't the most stylish digital TV box we've seen. Let's be honest - the word we're looking for is ugly. But put that thought aside, because this is an excellent entry-level box with a few tricks up its sleeve. The HB-1000S is a Freesat receiver. Freesat is an alternative to Freeview and can be a good option to choose if you experience poor Freeview signal quality in your location. You'll need a satellite dish to receive Freesat signals, and most Freesat users are probably ex-Sky users with a dish already installed. In this case, you can simply replace your Sky box with the Humax and start watching. There's no need to move the Sky dish, since Freesat uses the same satellite as Sky. If you don't already have a satellite dish in place then you'll need to have one installed. You'll also want to connect the box to the internet so that you can take advantage of catch-up TV and the home networking potential of the box. To do this you have three options. You can connect the box to your broadband router if it's in the same room. If not, you can run broadband via your electrical sockets using HomePlug adapters. Thirdly, you have the option to buy a USB Wi-Fi dongle and open up your Humax box to your wireless home network. A HDMI cable is provided to connect the box to your TV. You can also plug in a USB memory stick or other USB-enabled device. This enables you to access photos, videos and MP3s. You can also plug in a USB hard-drive to turn the device into a recorder. Freesat includes more than 150 free TV and radio channels and 6 HD channels, which is more than Freeview, although Dave is missing because of licensing conflicts with Sky. All channels are available subscription free. With the HB-1000S you can also access Catch Up TV and Video on Demand (VOD) via the BBC iPlayer, ITV Player, 4Od, Demand 5 and YouTube. You will need a broadband internet connection to access these. The electronic programme guide (EPG) makes it easy to find programmes you want to watch and those you might have missed. In addition, the Showcase feature highlights the most popular shows that you may want to watch. We don't find the system as easy to use as Sky, which is surprising when you consider that the device offers less functionality than Sky Plus. One of the bonus features of the HB-1000S is that you can use it as a hub to access content from any devices connected to your home network. Connect the player using the ethernet cable, a Powerline adapter, or via the optional Wi-Fi dongle (sold separately), and the box will search for content (photos, videos, music) that can be played on the TV. The Humax HB-1000S may not offer recording to a hard disk, but it's a very low-cost way to access Freesat, and includes the latest catch-up TV services and the benefit of home networking. While you can plug in a USB storage device for recording, if you're at all serious about recording programmes, we'd recommend the Humax HDR-1010S, which comes with a 500GB hard disk built in. Using a usb HDD with HB1000s? I have connected a usb HDD to my HB1000s. Immediately it is recognised and works well but after a while or after turning off the HB1000s, the HDD remains spinning, and turning the HB1000s on later, the HDD is not found. Unplugging the HDD and replugging sometimes works but that can't be good for either unit, surely. What is the model number for the wifi dongle for this unit? The only dongle available on the Humax web site is described as not suitable for the HB 1000 S, but there doesn't appear to be an alternative availablle. Otherwise, great product; does what it says on the tin. Haven't tried connecting external HDD to record with yet.